Think spinach – but cheaper. Much cheaper. At my local farmer’s market, I can get a full plastic grocery-sized bag of these sweet potato greens (which are literally just the green, above-ground part of the sweet potato plant) for $1.00. When I compared the volume of plant-to-cost ratio of $2.99 per bunch spinach at Whole Foods, I would guess that I got 5 times the volume of plant. So, 5x $2.99= $14.95 at Whole Foods vs. $1 at my farmer's market. That’s a savings of nearly $14 off the bat! But wait, there’s more! 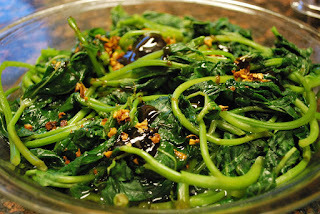 For fully-grown adult spinach, you generally have to eat the leaves and either discard or separately cook the more fibrous stems to get something edible. The allure of spinach for most people is the leaves – a quick wilt in some olive oil, salt, and pepper—maybe some chopped garlic and crushed red pepper flakes with a squeeze of lemon at the end—and you’re done! Most people I know toss out the stems. They’re just not worth the extra effort to the non-foodie who’s not on a tight food budget. Sweet potato greens are different. I took my kitchen shears and cut the stems midway. Basically, I cut off the largest, thickest part of the bottom of the stems, but left about 6 to 8-inches of stem attached to the leaves. 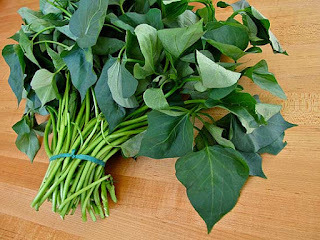 I roughly chopped this (stems with leaves) and cooked as above for simple spinach. This is excellent with an over-medium egg (or sautéed tofu) and sprouted-grain toast for a complete and healthy breakfast. What are SWEET POTATO GREENS?? 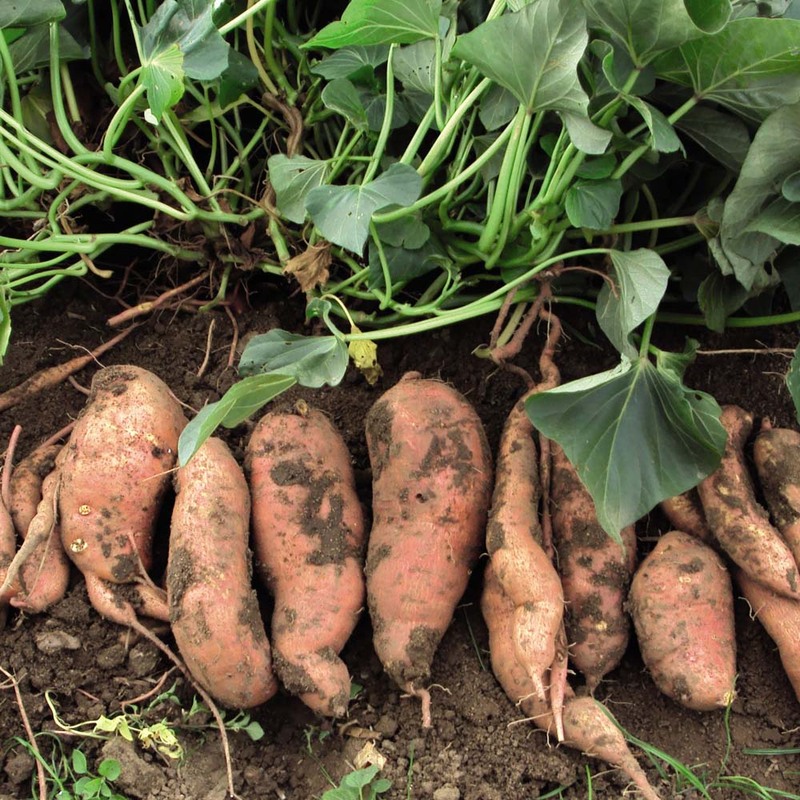 Sweet potato greens are literally just the top of the sweet potato plant. The orange part in the picture is what you're used to seeing in a traditional market; it grows under the ground as a root. The greens that I talk about in this post are the green parts you see in this picture; they grow above ground. 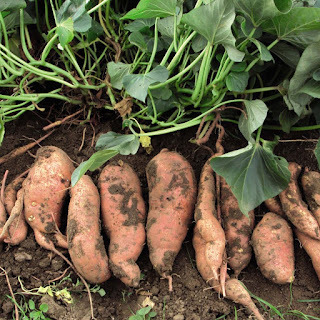 The greens are often discarded in the United States and most other countries who eat this prized tuber. In other places, like Thailand and Northeast China, they also eat the greens. Taste is where it’s at! The results were very similar. If you didn’t tell someone, they’d never know. By my palate, they have a little less bitterness than spinach. This is due to the lower oxalic acid content. Oxalic acid is compound found in many greens that contributes bitterness and inhibits calcium absorption. Bonus – get more of that calcium from the sweet potato greens! In a hearty portion, you’ll also get 3-4 grams of protein, some iron, fiber, vitamin C and vitamin A. Price check in: You can chop and cook the thicker stems, just like adult spinach and have little to no waste. For the life of me, I cannot figure out why more people don’t eat these greens! Clearly, availability is a big issue in the United States, but we have plenty of sweet potatoes. All it would take to get greens more widely available would be for people to start asking for them at grocers and farmer’s markets. Who wouldn’t want to make money on something that they generally throw away? 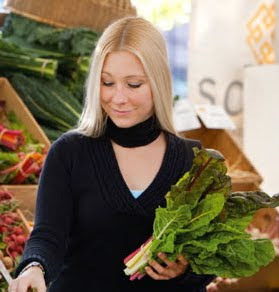 Next time you’re at a farmer’s market or Asian market, look out for sweet potato greens, try something new, improve your health and save some $$!